The June-August 2018 issue of Signals magazine, published by the Australian National Maritime Museum, includes an article titled Underwater Photographers in the Field written by Paul Teasdale of the Natural History Museum London. The article features interviews with and aquatic images by three category winners in the 2017 Wildlife Photographer of the Year contest (#wpy53). 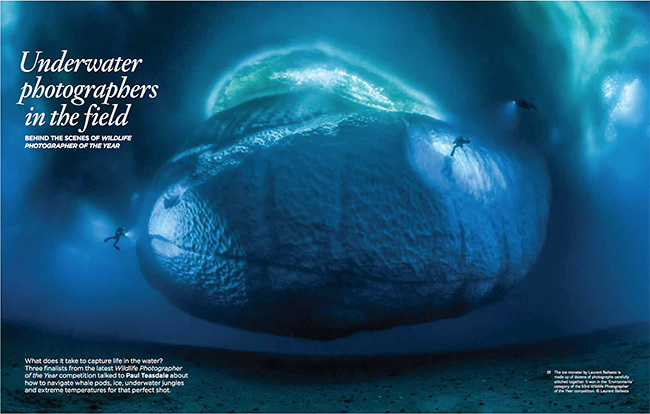 The lead image is a breathtaking underwater panorama from Antarctica taken by Laurent Ballesta. The other two featured images are my sperm whale image and a beautiful freshwater photograph taken by Michel Roggo. Click here to download a PDF if you'd like the read the article.